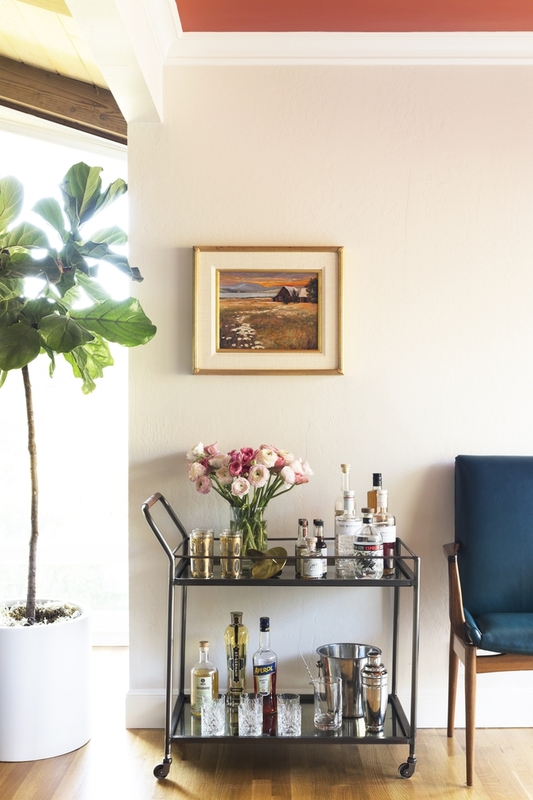 Getting a glimpse inside a beautifully remodeled mid-century modern home designed by Decorist Celebrity designer Chloe Redmond Warner is a design enthusiast's dream. Known for her unique modern-meets-classic design aesthetic, Warner mixes vintage finds with acrylic pieces with ease and perfectly intertwines layers of pattern and color. Today Chloe is giving us an exclusive look at her recent remodel of a mid-century house in the hills outside of San Francisco. Recently featured in , the home marries comfort and elegance with an eclectic, summery, Scandinavian vibe. It's truly a stunner! We asked Chloe to share her top five tips for getting her signature look. Of course, if you like what you see, you can book her to design a room of your own! In the living room, we redid the fireplace to be more prominent and hung two pendants from the ceiling to frame it. This look created instant drama in the room! I always love a good and well stocked barcart as it keeps a cocktail party close at hand. We hung art deliberately low to make this area feel loved. The stenciled floor brings a sense of occasion and drama to the entryway. Stenciling a wood floor is one of my favorite ways to add depth and interest to a particular zone in a large area. It really says you’ve arrived. Don’t let just one pattern do all the work, or it will become tiresome and a bit boring. In the master bedroom, we layered different patterns on the headboard, pillows, chair and rug to give depth and interest to the room that will last. It's fun to mix pattern on pattern to keep things fresh and unexpected. You can’t go wrong buying something big that you love. Heather Day makes such expressive abstract paintings and the one in this living room makes a statement. Thank you Chloe for share your designer tips. Feeling inspired? YOU can get Chloe's fresh and eclectic look. But hurry—hire her now while you can! She books up quickly!